> The song... It. Doesn't. Stop. A charming and endearing title from TT, brilliantly worked and suitably "awesome". Ideal for gamers of most ages, though for seasoned players it may be a little too easy. “Everything is awesome. 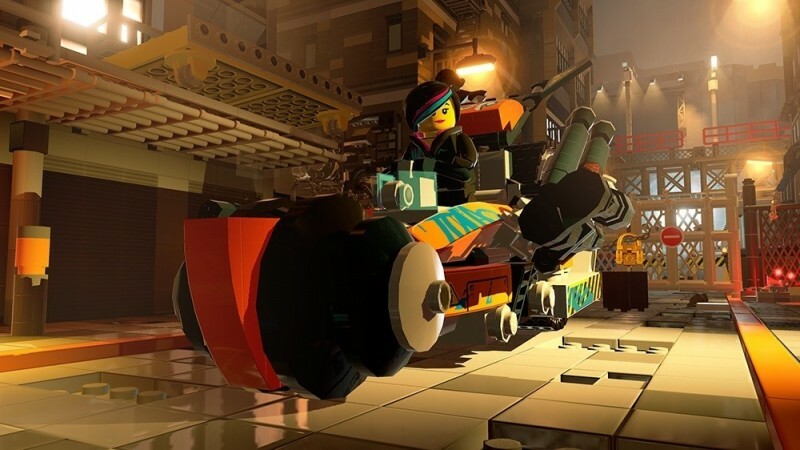 Everything is cool when you’re part of a team…” Prepare to bounce uncontrollably as you play The Lego Movie Videogame, and prepare to listen to Tegan and Sara’s “Everything is awesome” a whole lot. 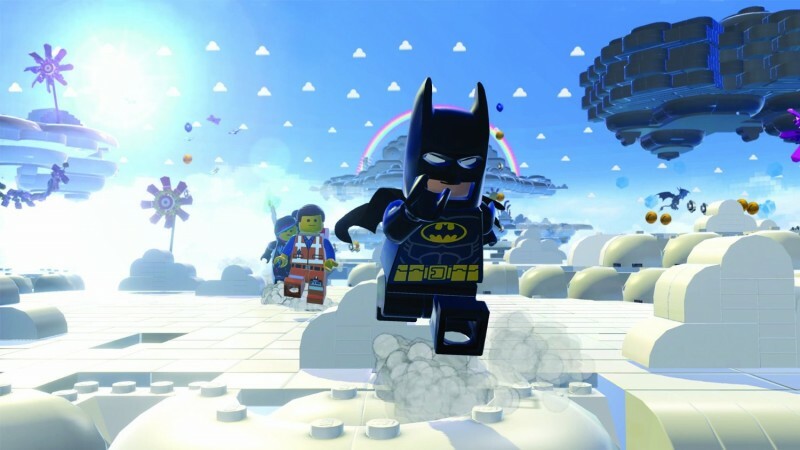 I’ve played all of the Lego games, bar Lego City Undercover… and that’s only because it’s a Wii U exclusive. One thing that is always resoundingly clear is that TT know what they’re doing. They’ve been making Lego games for a long time, and something they’ve never done is mess up a franchise. Star Wars, Harry Potter, DC, Marvel, The Hobbit, Lord of the Rings, Indiana Jones… all excellent titles with one main theme at their core; fun. 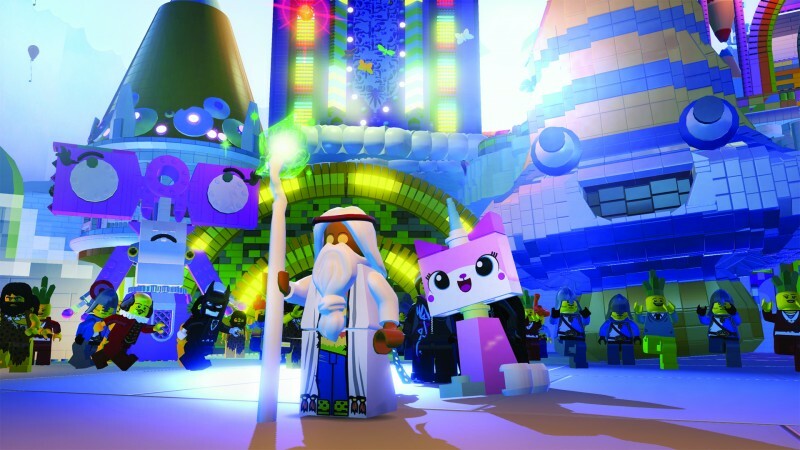 Using The Lego Movie as a basis for the title allows the developers free reign over prettymuch anything within the Lego universe, plus it’s able to use the humour from the movie to bolster the game’s narrative. Straight off you’re thrown into the plastic shoes of Emmett – an optimistic and suitably cheery builder minifigure who’s mistaken for “The Special” and is inadvertently dragged into a crusade to stop the evil Lord Business from gluing the universe together and getting rid of all creativity. Now before I start my review properly, I need to give you a heads-up or two. Firstly, I won’t be spoiling the plot of the movie or anything, so you can feel free to keep reading if you’ve not seen it yet. Secondly… I have two kids at my disposal – a 10 year old boy and an 8 year old girl… so I thought it’d be interesting to get them to review the game too. I’ll be incorporating their comments towards the end of my review so you can get a good idea of the scope of the game, and appeal to different age ranges. Wyldstyle on her bike… compensating for something? 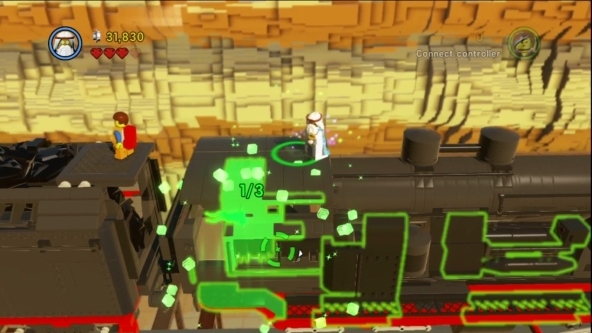 Straight out of the blocks, what’s apparent about the The Lego Movie Videogame is that it looks great. There’s a rich, and developed world for you to explore, and it seems that there’s always something for you to do. There’s little minigames everywhere, and the standard puzzles you can only do with certain characters – the usual tactic that works so well in terms of replaying levels in free play mode, but if it ain’t broke, don’t fix it! Some good examples of this mechanic are Unikitty, who can break apart, and build rainbow Lego, Wyldstyle’s ability centers around anything remotely acrobatic, Batman uses his Batarangs and Emmett uses his drill and wrench at the required moments. The character depth in the game (and the movie) is quite impressive, and something I really like is that when you’re wandering around the Lego Hub, when you bump into a character you don’t already own, you can buy them. You don’t have to go to a particular place to buy new minifigures. If you want to be incredibly lazy, you can just go into the character menu and buy any one that’s available. Aesthetically speaking the game is great. It’s a colourful and eye-catching world no matter which part you’re in. The character design is really good, and animation-wise it’s hard to fault. There’s loads of particle effects whether you’re dealing with fire, rainbow blocks or anything else. The sound in the game is typically cheerful, and fits each environment you’re in. There is a bit of an overuse of “Everything is awesome”… to the point where you can unlock “Disco Pants”. With these equipped you get the music playing (minus vocals) whenever you’re fighting, breaking apart Lego blocks, or doing anything for that matter. All the voice acting is great, and taken directly from the movie. You’ll hear Chris Pratt, Morgan Freeman, Liam Neeson, Will Ferrell and the rest of the cast throughout the game. I’m so glad that sound-alikes haven’t been used as this often completely ruins a movie/game crossover title for me. If the character you’re using is a Master Builder (yes… in some cutscenes it really does sound like masturbator if you’re not paying attention), you can hold down the X button when you’re in the designated area, and you’re asked to highlight 3 components. When you let go of X, your character springs into action, flying from one component to the next creating what looks like a Lego vortex while it builds the item in question. These are really simple diversions from the main gameplay, and they’re a welcome one. There’s a reoccurring minigame that you do with Emmett where you build large items from instructions. All this involves is selecting the correct Lego piece from a radial menu, and the quicker you do it, the more blue studs you get. However my absolute favourite one comes really early on, and is an homage to Guitar Hero/Parappa The Rapper where you dance to “Everything is awesome”. This is also where you unlock the Disco pants by the way. The humour that’s interwoven throughout this game is present everywhere. It starts getting more obvious when Batman makes an appearance, as he’s always stealing Emmett’s ideas and generally being a bit of a douche. A lot of humour is conveyed through the cut-scenes taken from the movie, and these are very frequent. At some points there seems to be more movie than game, though this is only really irritating nearer the beginning. In terms of what I didn’t like about the game, there’s not a whole lot. It’s pretty easy throughout… you’re not led too much, and the tutorial hints aren’t over-imposing… it’s just not hard. The song is a little overused and is a continuing theme – it’s used when you reach the stud target for a level for example. In the game there’s also 96 characters, though there’s a few different versions of Emmett that seem totally pointless as there’s next to no difference – this just seems a lazy way of upping the character count. There’s the aforementioned over-frequent cutscenes, and sometimes the load time between levels seems really long. Batman invades Cloud Cuckoo Land… because he’s Batman, dammit! When I asked Jack (my 10 year old) about it, he prettymuch ignored me as he was too fixated on playing. However when I managed to divert his attention he said he loves it. He likes the minigames, and Unikitty is his favourite character because when she jumps “it looks like she farts rainbows”. He likes it when Unikitty gets angry too, as she grows to a ludicrous size and destroys everything. Phoebe (my 8 year old) likes playing the game too, and she can’t help but sing along to “Everything is awesome” whenever she hears it. It takes her a little longer to get the build minigame where she had to pick the right Lego piece from the menu, but she still found it easy enough to work her way through a level in a decent time. 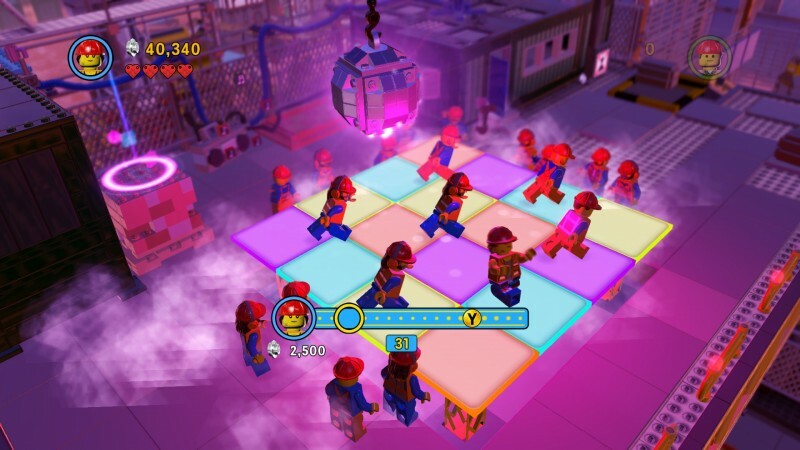 Overall I really like The Lego Movie Videogame – it’s fun, and the replay value is off the charts as in other Lego titles, tripling the 7 hour playtime by being able to go over levels in free play mode. The character creator is good fun, with a plethora of options available to mess around with. The title is easily accessible for most ages, but older players may find it a little too easy. If you’re a fan of the Lego games, you need to get this. If you haven’t played them before, this will also be a decent introduction. Either way, you should enjoy this.